If you’ve been following me on instagram you know I’m obsessed with Breakfast Cookies. It’s like having your bowl of oatmeal in the morning except you can take it to go without having to actually make oatmeal, wait till it cooks, then schlep it in a container with a spoon and worry about making a mess on the way. Ugh. Nope. All you gotta do is grab some from the fridge, throw into a ziplock bag, and eat it on the way to work. Or you can eat them at home with your morning coffee. Or have them as a convenient snack. So many choices! Point is, they are super handy and require zero prep time in the morning. I can’t even count how many times they were a lifesaver on busy mornings. 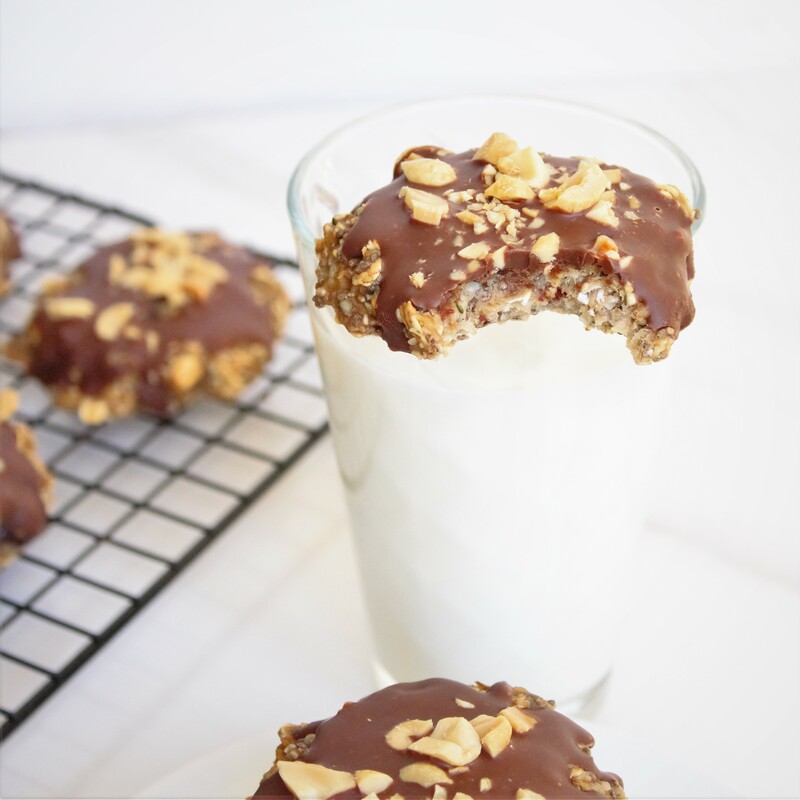 Like the title describes – these cookies are fully loaded… with nutritional goodness. I used to make breakfast cookies with just bananas and oatmeal but I upped my game by adding chia seeds, hemp seeds, & peanut butter powder for extra fiber, protein, and heart healthy fats. All to better satisfy you and nourish your body. Of course, I had to take it one step further with a peanut butter and chocolate drizzle because everything’s better with peanuts and chocolate, amiright?! I hope you enjoy these Breakfast Cookies the next time you’ve got a busy morning. You’ll thank for me these, I promise! In mixing bowl, combine mashed bananas, oats, chia seeds, hemp seeds, PB2, vanilla extract, chocolate chips (or raisins) until all ingredients are well blended. Scoop out the mixture (using a medium sized cookie scoop) onto a lined baking sheet. Flatten out each cookie using your hand. The cookies will stay the same size and shape as they are when you put them in. Bake for 10 minutes. Remove and cool completely. Combine melted chocolate with peanut butter until well combined. 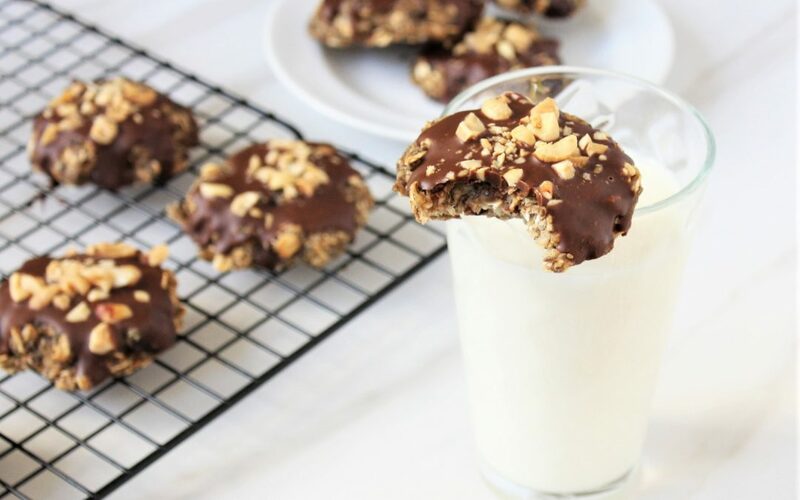 Pour over cooled cookies and sprinkle with chopped peanuts. Enjoy! Store in the fridge for an easy grab n go breakfast!